General Motors has filed a flurry of patent applications for active aerodynamic systems over the past couple of years, and the latest set of approved ones could have some interesting uses on cars we’ve been keeping our eyes on. One of the patents shows an active aero system specifically for a mid-engine vehicle, while another details how such a system could work for a hybrid vehicle. These patents lend credibility to reports that GM is likely working on active aero and hybrid powertrains for the mid-engine Corvette. The first patent is titled “Aerodynamic actuator control systems and methods” and describes how various modules could collect data from a sensor array in order to determine the amount of downforce to be applied by the active aero system. The vehicle used in the diagrams appears to be a current generation Corvette, but that is not unusual as automakers will often slot in a a generic diagram for these systems. The notable part of the patent is the description of all of the modules that will interact with the engine control module and this active aero system which appear to point out that the vehicle involved could use an electric motor that would be controlled by a hybrid control module. Since it is highly unlikely that GM would redesign the current Corvette to be a hybrid, the most reasonable explanation is that the rumored C8 mid-engine Corvette would be the one to see the hybrid technology shown in this patent. This patent would fall in line with the report from a few months ago that stated that we could see a C8 with a 1,000 horsepower hybrid powertrain that would be comprised of a 5.5-liter V8 powering the rear wheels and a 200 horsepower electric motor for the fronts. Another patent, which is titled “Vehicle, system, and method for controlling active aerodynamic elements” explains how an active aero system could be controlled but more importantly it appears to be the first time that GM has marked one of these recent patents with a diagram showing a mid engine vehicle. In the diagram from the patent shown above, the engine is marked as item 104 while the transmission is marked as items 106. The active aero elements are marked as item 140. The patent goes on to describe the function of the active aero systems and the inputs used to control it. The description states that system could be used to adjust the aerodynamic properties of a vehicle while it is motion, along with being used to change the direction of airflow for cooling systems used in the described vehicle. As usual, these are only patents and actual design decisions yet so they may never get used on a car. 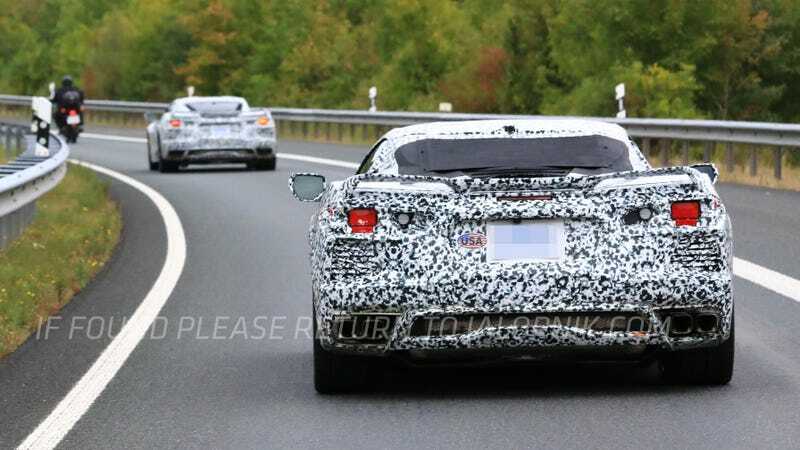 But they do offer an explanation for the speculation we have seen regarding the rumored mid-engine, Corvette so it is very possible that we’ll see them used in production in the next few years.